Maximizing the momentum of the rebounding oil and gas industry, Summer NAPE returns to the George R. Brown Convention Center Aug. 15-16, bringing together upstream decision-makers and investors in a one-of-a-kind expo packed with lively networking events, informative seminars and an unparalleled marketplace for buying, selling and trading prospects and producing properties. Revving up the excitement, this year’s show will conclude with drawings for two new Harley-Davidson motorcycles! 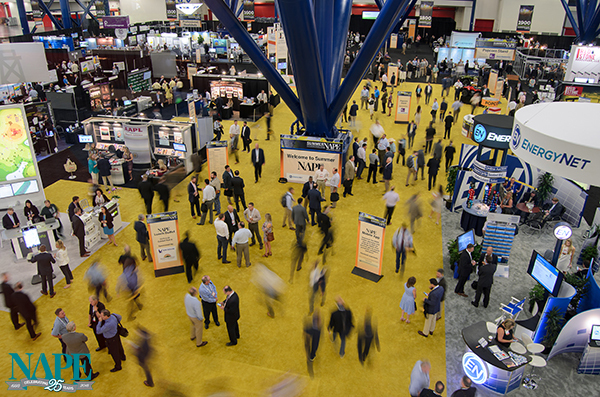 “Each year, Summer NAPE allows oil and gas professionals to connect with one another and make deals happen, and this year will be no exception as we continue to celebrate NAPE’s 25th anniversary,” said Jim Devlin, chairman of the NAPE Operators Committee. Summer NAPE brings together all things related to the upstream oil and gas industry — prospects, properties, products, service providers, investors and all the decision-makers necessary to close a deal. In addition to a tradeshow floor filled with hundreds of exhibitors, the expo provides unique networking opportunities for attendees. On Wednesday they will enjoy an all-show “Icebreaker,” and Thursday they can easily meet and greet professionals from specific geographic regions at the popular “Hot Play Happy Hours” hosted at local hotspots near the expo. Opportunities also abound to learn from industry leaders. At Summer NAPE’s popular Business Conference, numerous C-suite presenters share their insights on the challenges and opportunities — now and to come. “The 2018 Summer NAPE Business Conference will give us a chance to reflect on the lessons learned in oil and gas exploration over the years and look forward to the policies and rising talent that will impact us in the years to come,” Devlin said. Later at the expo, the IPAA will present a special government relations session providing insight on the changing framework of federal regulations under the Trump Administration. In addition, the day before the Summer NAPE expo begins, IPAA will present an oil and gas overview course and the OCS Advisory Board will host a half-day summer seminar. Separate registration is required. Attendee and media registration is now open for Summer NAPE 2018. Those interested in attending or participating with an exhibit booth may find information regarding registration at www.napeexpo.com. Members of the media who would like to attend and cover NAPE are invited to register online at http://napeexpo.com/media or onsite.